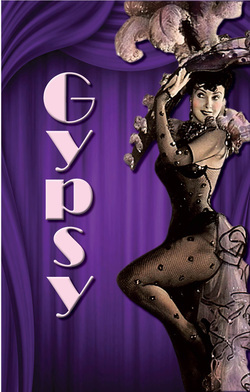 Gypsy is presented by special arrangement with Tams-Witmark Music Library, Inc.
Based loosely on the memoirs of burlesque artist Gypsy Rose Lee, this 1959 musical is about the ultimate pushy stage mother. The story begins in the 1920s as Rose pushes her two young daughters onto Uncle Jocko’s Kiddie Show, their first stop (so she believes) on the road to vaudeville fame. They set off across the country, living out of dilapidated hotels, never quite achieving the kind of stardom Rose has in mind, until once-shy Louise transforms herself into striptease artist Gypsy Rose Lee. With well-known songs like “Let Me Entertain You,” “Together, Wherever We Go,” and “Everything’s Coming Up Roses,” Gypsy occupies a much-lauded place in American musical theatre history.